The operations were the easy part, recovery from them was quite another thing. We spent a total of four weeks in hospital recovering, before going home. I woke up quickly after the operation on me was complete. This was because surgeons want to see the response of their patients, to make sure all is well. The surgeon told me everything went great, and that I could go to Intensive Care. I was still under the influence of pain medication and the narcosis. Zuzana and my family quickly showed up for a status update, and I went back to sleep very rapidly. I was Very tired. My stay in the IC was very brief. The whole time I had a feeling of nausea. I was very thirsty and had dry lips, but couldn’t yet drink. The nurse helped me out by rubbing a cloth with water on my lips. Most of the time I slept, or staring at my surroundings. I spent one night there, and at 11:00 the next morning I was taken to my room. I was healing very well, and nothing had happened in the night. It was safe to decouple some of the infusions, and move me to medium care. On the way there we stopped over to see how Alexander was doing after his operation. It was a strange moment, laying there next to him. The only sort of complication I felt was a distinct tingling sensation in my fingers, and a dull pain in my shoulders. The tingling and shoulder pain would leave my body in a few weeks. During that time it took some investigating what it could be. With the help of a Neurologist we reached the conclusion that it was due to laying in an awkward spread position for eight hours. This most likely damaged the nerve clusters in my shoulders. Two months after the operation I still had a numb left forearm and a tingly and oversensitive left thumb. This nerve probably lost most of its myelin  insulation. This would take a long time to regrow. The next few days saw no complications, but a steady grow in strength and mobility. A good measure of how well it was going was the amount of tubes still in me. The wound drain (to get rid of any fluids like blood or bile from the operation) was empty from day one so was very quick to go. On the third day the epidural anaesthetic was removed. The plan was to switch me over to pill-based medication. That was probably too soon. The moment it was gone I started feeling a lot of pain. It takes time to get the right level of pain killer in the blood, and in the intervening period I had something amounting to no pain killer at all. The most surprising of all was that I thought my bed was really comfortable. Boy, was I wrong. Most of the pain was in my back. I spent the afternoon and night in a huge amount of pain. No sleep was had, and most supplemental medication didn’t help. Only a day later I finally felt like the pain was abating. A lot of discussion followed with the anaesthesiologist who wanted to find out if there should be better guidelines for when to pull out epidurals in these cases. Me trying to look relaxed with an arterial tube in my neck. From then on my heath improved quickly. It didn’t feel like that. In a hospital all sense of time leaves you. I spent my days watching series on my laptop, sleeping, reading and building some Lego. The Lego was especially helpful as it made me walk a little bit to the table and back again, and get some of my fine motorics back. I still felt very tired and sore. I had very little appetite, so didn’t eat much. I lost 5kg of body weight after the operation. My mom pushing me to the hospital in my wheelchair. Even though every day was tough, I was progressing fast. Lines came out of my body, and I was moving more and more. Suddenly it was time to leave the hospital. After seven days all the lines had gone and the pain had stabilised. 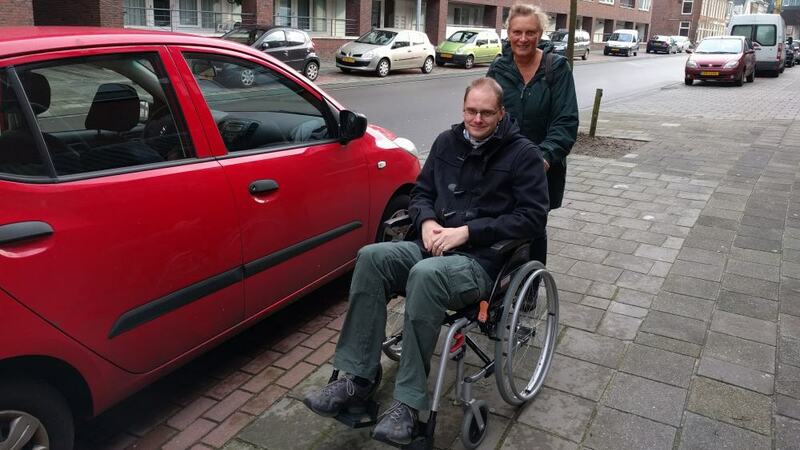 I still needed a wheelchair to get around, but I didn’t need to be cared for in the hospital anymore. There was still quite some pain, they gave me some heavy painkillers for that. I moved to an “In between house”, an apartment owned by the hospital, specifically for use by families of donor patients. There I would spend the next few weeks, with my parents taking care of me. After a week I could stop taking the pills, and started to slowly get my stamina back. Alexander’s recovery wasn’t so easy. When he came out of surgery, his belly was still open. The exposed liver was covered by plastic, to decrease the chance of infection. There were good signs; after the operation doctors checked the clotting of his blood, by measuring the level of Heparin  in it. IC noticed that his coagulation was extremely good. they had to give bigger dose, because the liver was so powerful that it broke down the medicine on its own already. He also needed a very high dose of morphine against the pain; twice the amount other children of his age and weight would have. Mainly because his metabolism was so efficient. 2-0 for the new liver. All children get a breathing tube during (and after) an operation like this. Again here we saw how strong Alexander really was; mostly he was breathing on his own, and the tube added very little extra air for him. However he still looked very sad. 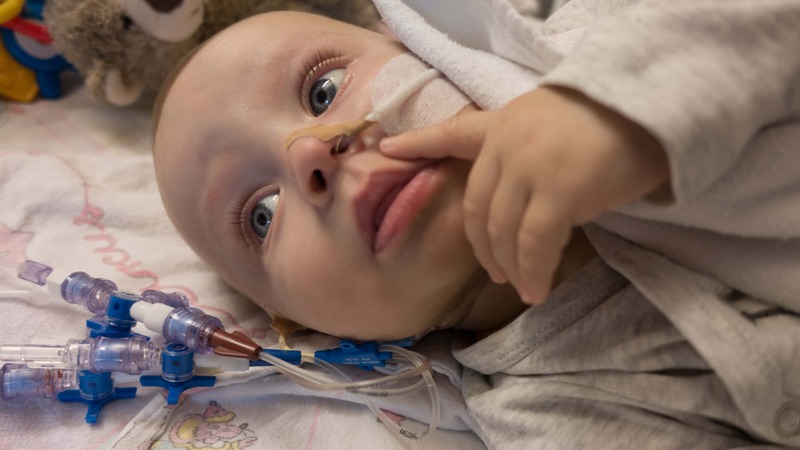 Because of the breathing tube and medication he couldn’t make any sounds. He would want to cry, but couldn’t. All we could see was him trying to open his mouth and looking at us. It was very painful to watch. 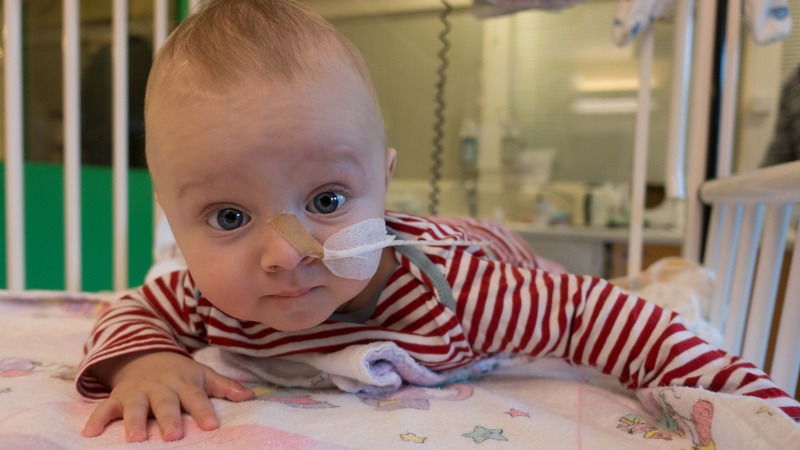 After three days in Intensive Care, Alexander’s new liver had healed enough for his belly to be closed. For this he went to the operating room. It was only a short procedure. Two days after his belly was closed, there suddenly was a major complication. During a regular Ultrasound check, the doctors discovered reduced blood flow through the liver. The next morning the flow was completely lost. Alexander had developed a blood clot in his portal vein . He was rushed into surgery. 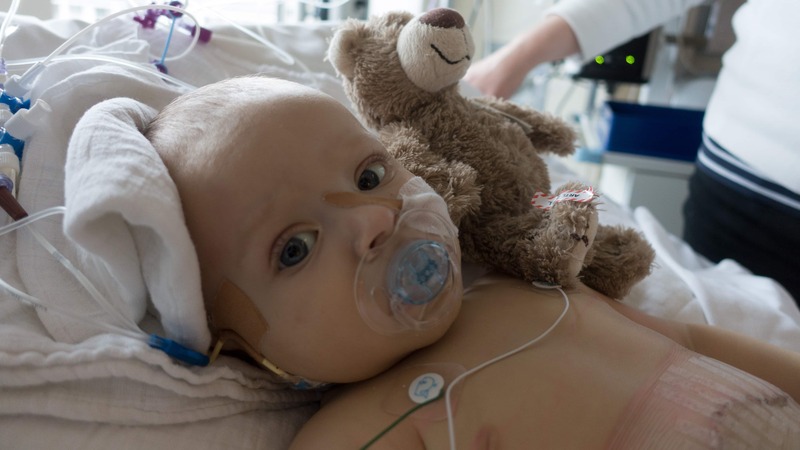 During the transplantation the decision had been made to leave Alexander’s own portal vein connection in place. It seemed that the Biliary Atresia hadn’t damaged it too much. Unfortunately, now it became clear that it had been damaged. Fortunately they had taken some spare parts from me during surgery, and put them in a freezer. These extra veins now came in handy. The surgeon used them to fabricate a new connection. This was successful, and Alexander made his way back to Intensive Care for the third time in a week. Alex after his belly was closed. Alexander getting some life back. 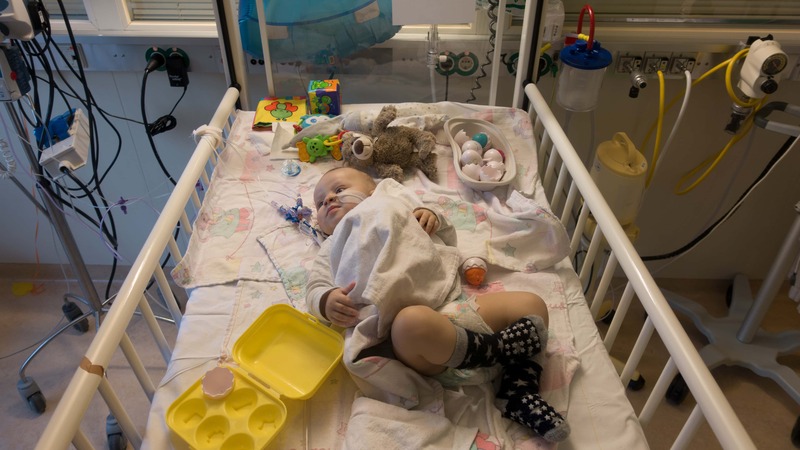 Seven days after the transplantation Alexander could finally be moved to the medium care ward. This was on the exact day that I was allowed to leave hospital. Alexander was stable, and healing well considering the triple surgery he just had. But from now on, he only had minor, secondary complications. For instance, his bowels weren’t used to bile, so this was very painful for Alexander. Also, the nurses had some difficulty trying to get the dosage of anti-coagulation medication right, so this meant a lot of trial and error on their part. 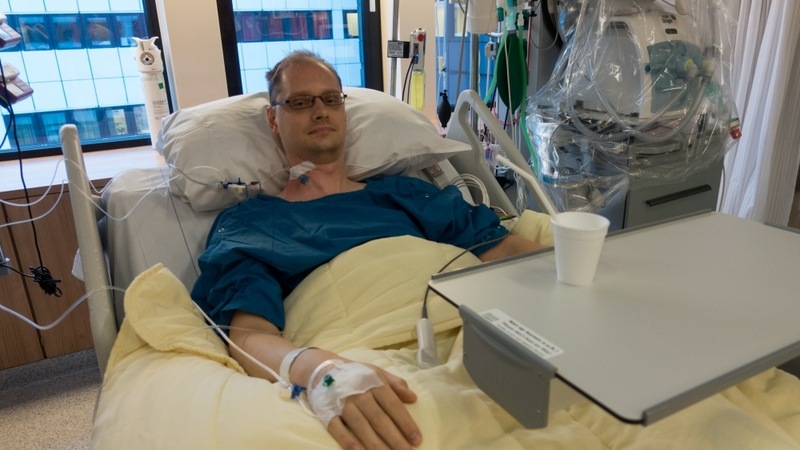 There was also some confusion about his Tacrolimus  (An immunosuppressive drug used mainly after organ transplant to lower the risk of organ rejection) intake. The doctors thought he was throwing it up because his stomach wasn’t used to the medication, and they started looking for ways to actually bypass his stomach. At some point they wanted to put a feeding tube inside his intestines. But after trying to force it in for half an hour, we told them to stop it. We then had a Very Serious Talk about what actually was the problem: Alexander just didn’t like the way the medicine was being forced down his throat. When Zuzana took over the administration of the medicines, all problems went away. Alexander in his natural habitat. 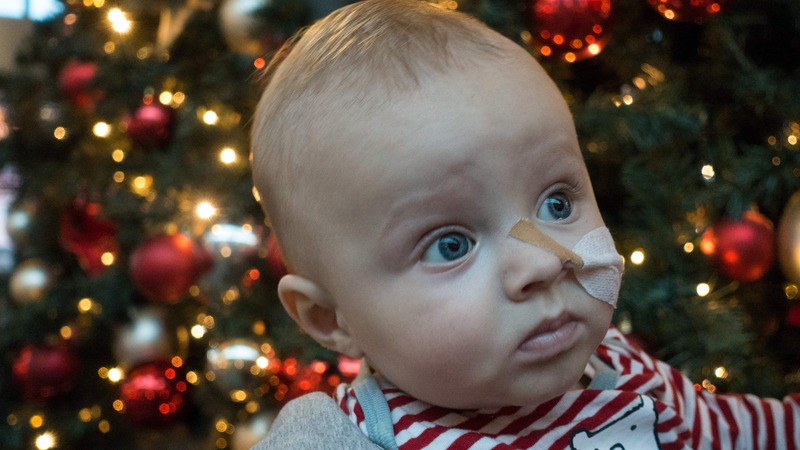 After two weeks in hospital, Alexander smiled again. 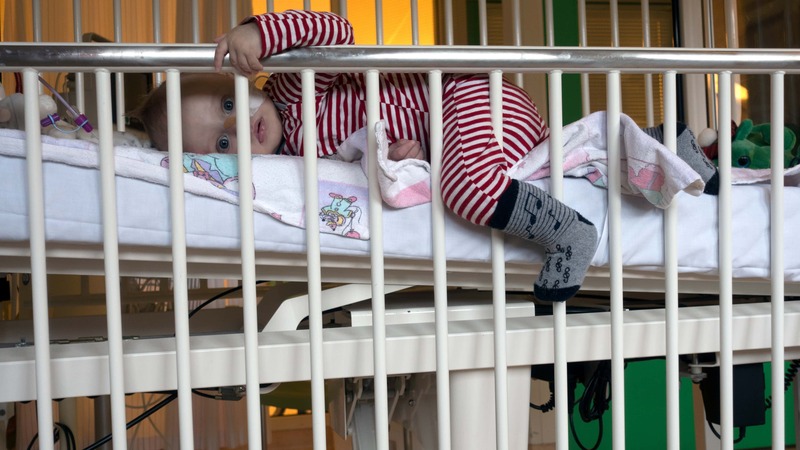 After three weeks it became clear that if we would be able to administer medication at home, there was only one thing keeping Alexander in the hospital. that was the drain in his belly. The drain was put there so any excess fluids wouldn’t build up in his stomach cavity, but drain out of his body. There were still a lot of fluids coming out of him through that. Not so much blood, but fluids from the lymphatic  system that was cut during surgery. As they were too small to sew back together, they needed to heal back up in their own time. This process was finally helped along by a change in his diet (lowering a certain type of fat content so it didn’t turn up in the lymphatic system). Within two days the lymphatic fluids stopped flowing and drain could be removed from his belly. Alexander, ready to go home. Alexander is ready for Christmas. Now Alexander was ready to go home. He was stable, and only needed special feeding and a lot of medication. Nothing we couldn’t handle. We had expected to be in the hospital until January, but now we could go home a week before Christmas. Things were looking up.